American Pallet, Inc. is prepared to provide our customers with a total commitment to quality and service. As a privately owned pallet company, American Pallet, Inc. has the personnel and resources to provide our customers with efficient pallet programs. 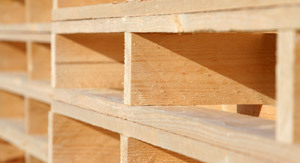 We provide the best quality used, recycled and new pallets in the area. We manufacture all orders in a timely manner, providing our customers the security and stability that they desire in a pallet company. At the same time, American Pallet, Inc. is dedicated to developing strong partnerships with our customers through our ability to develop cost efficient pallet programs.